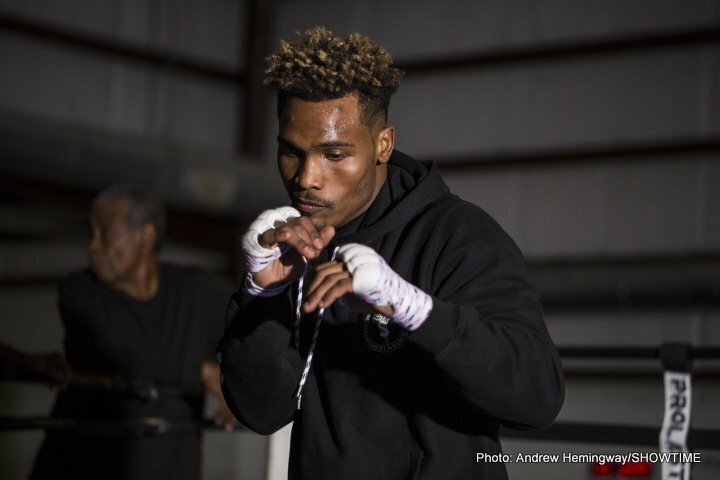 By Jim Dower: Interim WBC middleweight champion Jermall Charlo thinks WBO 160lb champion Billy Joe Saunders is a complete “trash of a fighter” and he would more than happy to face him and beat him if the opportunity presents itself. Charlo thinks Saunders talks a lot of trash, and he would love to shut him up. Charlo (27-0, 21 KOs) is waiting for a potential title shot against WBC champion Gennady ‘GGG’ Golovkin, as soon as the World Boxing Council orders that match. “For sure, I would love to fight him,” Charlo said to Behind The Ropes about Billy Joe Saunders. “The fact that he talks a lot of s—t. It would make the fight a lot better, because you all know what I do to people that run their mouth like he does. Billy Joe Saunders is a complete trash of a fighter to me. I haven’t seen anything that stands out about him other than he knows how to run. Stylistically, he’s not slick enough. He doesn’t bring any real threat to me. I’ll easily take that fight. I would definitely fight him. Politics are involved,” Charlo said. Charlo would have a very good chance of beating Saunders, and possibly knocking him out. Charlo is faster, taller, stronger and more athletic than Saunders. The chances of Jermall, 28, getting a fight against Saunders (26-0, 12 KOs) are all but impossible right now. Saunders is defending his World Boxing Organization middleweight title this month against #6 WBO Martin Murray (36-4-1, 17 KOs) on June 23 at the O2 Arena in London, England. If Saunders wins that fight, he could be facing either Saul Canlo Alvarez or Gennady Golovkin. Both of those fighters are interested in facing him. It’s unclear how much true interest is coming from the Canelo’s promoters at Golden Boy to make a fight between him and Saunders. It’s possible that Golden Boy is just using Saunders’ name to attempt to get GGG and his promoter Tom Loeffler to agree to the 65/35 purse split that they want him to agree to for the fight. Charlo says he was given a contract offer from Matchroom Boxing USA promoter Eddie Hearn to sign with his promotional company to fight on his DAZN platform. However, the money is no better than what he’s been getting in the past. Charlo says Hearn is going to make a better off to him if he wants him to sign, because right now the money isn’t good enough. It’s quite possible that Hearn will be open to sweetening the offer to the unbeaten Jermall, because he needs at least one of the two Charlo brothers to help create interest from boxing fans in subscribing to his steaming network to watch his fights. The guys that Hearn has signed so far aren’t the types that will attract interest from the boxing fans to subscribe. Hearn could on the verge of signing WBC lightweight champion Mikey Garcia. However, Garcia, 30, fights in a weight class that doesn’t’ have a large following with the American casual boxing fans. Mikey fights at lightweight, and the fans don’t get super excited about watching guys that small in large numbers. Mikey is going to need to movie up to at least 140 for him to get a large following. Mikey already fought his last two fights at lightweight and he took punishment against Sergey Lipinets. “He just sent us a decent contract,” Charlo said about Hearn. “It’s nothing I’m so excited about. It’s nothing I’m not making. He got to come harder than that if he’s really trying to get us to take our talent over to the UK. He’s got to come harder, because the numbers that he’s showing, we’re making that now,” said Charlo. Hearn has a lot of money with his $1 billion contract over eight years with DAZN, but he’s not shown the ability yet to offer enough money to the top Americans fighters to get them to sign with him. Hearn if offering money that perhaps the British fighters would accept, but thus far not the American ones.